In an effort to discourage the shenanigans that are occurring in the current Mayor and Council election, I’ve filed an official complaint with the City’s Board of Supervisors of Elections (BOSE) this week. 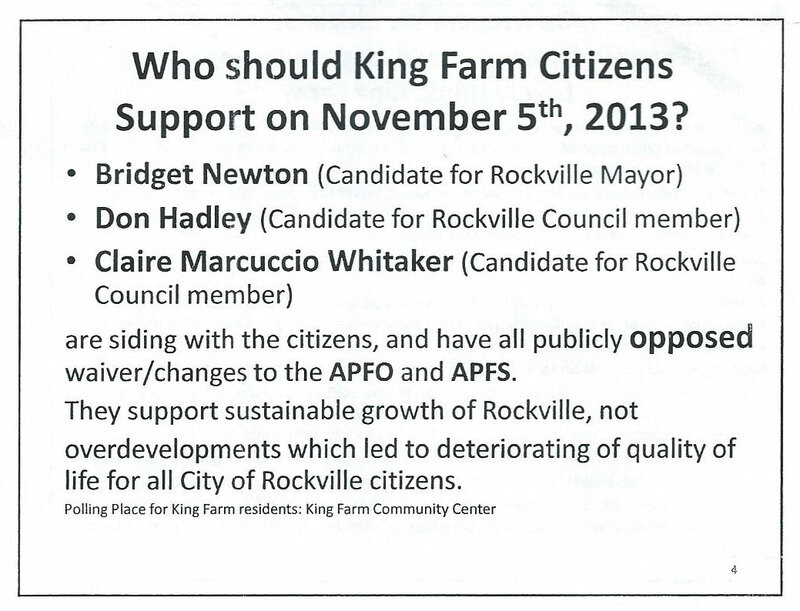 Last weekend, a couple people were distributing a flyer door-to-door in the King Farm neighborhood that called for the election of Bridget Newton, Don Hadley, and Claire Marcuccio Whitaker to the Rockville Mayor and Council for various reasons. That’s not a problem except it was anonymous, a tactic I find cowardly because the source is secret and isn’t accountable for their statements, but in Rockville, it’s also illegal. The City Code states that, “Every person who publishes or distributes or causes to be published or distributed any pamphlet, circular, card … relating to or concerning any candidate … shall include the name and address of the person, treasurer, or campaign committee responsible for the literature.” That’s why you always see the “by authority of” line on election signs and campaign literature. 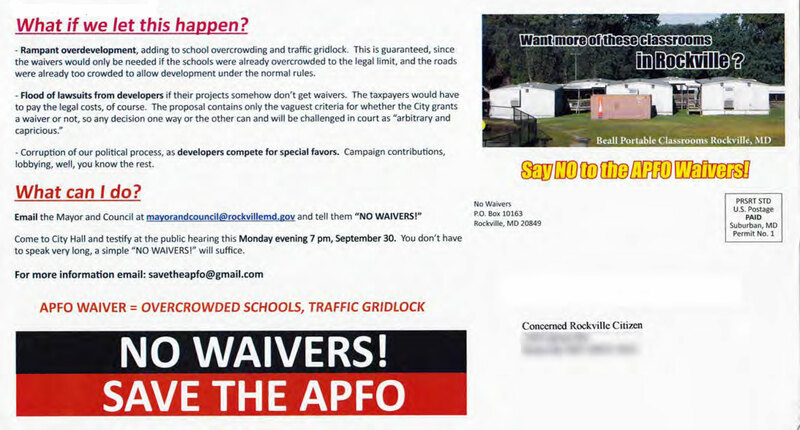 Unethical APFO postcard mailed in September 2013. Why the fuss? The United States distinguishes itself among the nations as the oldest democracy in the world. Yup, just a couple centuries and you’ve established a world record as a democracy–this isn’t a pursuit for sissies. Maintaining our freedom and liberty is partially the result of ensuring that decisions made about our lives are done in the open (not in secret, like in China) and as a community (not by one person, like a king). I’ll admit it’s not the most efficient process. Making decisions in the open and as a community is messy, slow, and unpredictable, but the process is as important (perhaps even more important) than the product. What we’re experiencing in Rockville in this series of anonymous flyers prepared by a small group of people working in secret to undermine the democratic process. They don’t want to have a discussion, they don’t want to be identified, and they prefer to make decisions in secret. This tactic, however, can be effective and swing undecided voters or cause people to storm City Hall (we witnessed that on September 30). Unfortunately, its corrosive nature can quickly be adopted by other groups who also prefer to work in secret to affect elections. Our history is littered with them, but I don’t want to welcome them to Rockville so I’ve filed this official complaint. Can you imagine what Rockville elections would be like if every candidate was financed, organized, and promoted in secret? I could easily distribute lies about my opponents and cheat to win an election without being held responsible. Yesterday, the Board of Supervisors of Elections held a regular meeting and discussed my complaint. They’ve decided to start by contacting each of the candidates and their treasurers about their knowledge of the flyer and postcard. This may seem tame, but if people intentionally lie to or mislead a city board during their fact-finding, it can be grounds for perjury. The three candidates who are attorneys–Tom Moore, Don Hadley, and Claire Whitaker–have even more at stake because as “officers of the court”, they can jeopardize their legal careers and be disbarred. The King Farm Assembly and Twinbrook Citizens Association are named in the King Farm flyer, but they’ve denied any association or knowledge of it. Max: you are getting paranoid. This is a tempest in a teapot designed by Max and Co. to distract from the real issues in this election. In past elections much worse behavior has been used to smear candidates–sometimes to their detriment. We can’t control what individuals in a community do on their own. In fact, as long as the amount of money spent to publicize their views is less that $500 there is nothing illegal about what they are doing. Max do you really want to stifle free speech by charging someone with an election violation where none exists? Smacks of intimidation. I’m not sure how I’m stifling free speech. I’ve consistently supported free speech, indeed, that’s why I created this blog. I freely allow anyone to respond as long as it’s not obscene or hateful. Right now, there are plenty of letters going around town supporting or opposing candidates but the only one I’ve reported to BOSE is the anonymous one in King Farm that’s been produced and distributed by a several people, not an individual. I don’t believe any of the people named in the flyer are involved, but those who are involved should have included their names—that’s the rules for fair elections in Rockville. I didn’t file a complaint about what they said (although I do disagree with many of their statements) but how they said it. Everyone should play fair and follow the same rules, that’s all. I assume by what you mean by “real issues” is the Adequate Public Facilities Ordinance (APFO) because that was the topic you most recently discussed with the Mayor and Council. I’m not sure, however, that it’s an issue that’s “real” or relevant to most residents in Rockville. From my conversations with people around town, I’m astounded at how few know about it and if they do, they either have a superficial knowledge of it or really don’t care. Most people in Rockville hate traffic and overcrowded schools (me included), but only a small minority (I’d put it at 20 percent or less) feel the APFO can or will provide much relief. Secondly, the residents that most ardently support the APFO seem to be fickle, which really muddies the waters. On September 30, we witnessed a crowd of people at the Mayor and Council speaking against any waivers to the APFO—no project should be allowed to escape the standards. And yet, two weeks later on October 14, many of the same people supported KSI’s mixed use project at 255 North Washington Street, which includes 325 residences within the overcrowded Beall Elementary School boundaries—a project that is only allowed because it received a waiver from the APFO. Adding to the confusion, in 2008 many of the same people opposed Beall’s Grant II, a housing development in the same area that was less than half the size at 109 units. I’m not sure how to explain the inconsistencies, but it doesn’t seem to be about traffic and school overcrowding. I’d love to have a community conversation about this to better understand the issues, but it can’t be at City Hall—the room arrangement and environment seems to only promote confrontation and conflict. 3. If BOSE is unable to complete their fact-finding before the election, they will continue afterwards. I’ve revised the post to clarify these points. Mrs. Neuman also stated that BOSE takes my complaint seriously, does not want to see these types of activities in future elections, and encourages any one with any information to please contact the City Clerk’s office. This is despicable behavior and members of city boards like the two commenters above–should disavow these tactics immediately and assure they understand and will uphold the law and will demand that all candidates follow it. Why would MAX be paranoid? All of team Rockville was just endorsed by the Gazette. Whoever wins should win fair and square, not by stooping this low and hiding behind false claims. I hope this is investigated thoroughly. And someone whose neighborhood has been ripped apart the past five years over mailings like this (and I got the APFO one) I can attest to the harmfulness of anonymous, divisive, illegal and error-laden mailings. They are unacceptable and need to stop. There are enough true issues and differences of opinion among the candidates that voters have a choice; there is no place for this kind of thing here. Joe Jordan’s comment of October 27 was removed at his request on October 28 because it contained errors. The requirements of this subsection (7) shall not apply to any individual publishing or distributing campaign literature promoting the success or defeat of any principle or proposition submitted to a vote at any City election, provided that such campaign literature is published and distributed independent of, and not in coordination with, any campaign committee or other entity. Thanks! That’s the right citation and language–individuals are exempt but two or more people (that’s the code’s definition of a committee) are not. A couple King Farm residents saw a couple people distribute the flyers during the past two weekends. If just one person was involved, this wouldn’t violate the rules; if the code defined a campaign committee with a larger number, it may have not violated the rules. That’s not quite true. Clearly it depends on WHO the individual is and if the materials are “published and distributed in dependent of, and not in coordination with, any campaign committee or other entity.” Someone not putting a name to this kind of activity is a loophole and not at all in compliance with the spirit, if not the letter, of the law. At tonight’s City Council meeting, Echo Lin, a resident of King Farm, revealed that she distributed the anonymous flyers. I was taken by surprise because I had assumed we’d never find out, so I’m glad this was concluded so quickly. The Board of Supervisors of Elections will meet on Wednesday, October 30, so it looks like this issue can be settled and closed before the election. I had a long chat with Ms Lin and her husband afterwards and learned that she’s concerned about development around her neighborhood and wanted to encourage her community to vote (only 8 percent of King Farm residents vote, according to her research) so she put together the flyers and passed them out to her neighbors. I’m glad she cares so much about her community that she learned about city issues, shared her findings with her neighbors, and is urging them to vote–it’s an experience she wasn’t permitted to have growing up in China. It’s clear that the flyers are the work of an individual, not a group, so distributing them anonymously is permitted by our election code and aren’t considered shenanigans. Although it’s not required by law, I did encourage her to add her name to the flyer so people could call her if they had questions or wanted to learn more. I’m sorry I put her through this, but our election code states that anonymous literature can’t be distributed by a campaign committee (that’s two or more people) and a couple people informed me that they saw a couple people distributing the flyers. Someone asked me afterwards if I would have handled it differently had I known only one person was involved, and I said, “Sure, but that’s like asking me if I would have read a mystery novel differently if I knew that the butler did it.” Perhaps the election code needs to be updated for the 21st century (for example, it mentions telegrams but not websites, and sections 8-87(c) and 8-101(7) seem unnecessarily complex), but right now, it’s what we have and everyone has to play by these rules. If there’s a silver lining to this event, it’s that more people are talking about the election and their rights as citizens. Hooray! This is not the best way to see it happen, but with so few people voting or caring about the other rights we have as Americans, it’s great to see those that do. After this week’s debacle where you were so quick to jump to erroneous conclusions by accusing a resident of “unethical and illegal behavior,” I would think you redouble your efforts to get the facts straight. Your statements regarding the KSI project are inaccurate. There was no waiver issued for this project as this project was approved as a PDP in 2004. The APFO was implemented in 2005. As long as the revised site plan does not exceed the parameters of the initial PDP, KSI can proceed. In addition, your statements regarding Bealls Grant II are also incorrect. Bealls Grant II was approved in 2008. It was subject to the APFO, which was improperly applied and is why the BGII approval was later overturned. A simple search on the City’s website would have turned up these facts. Or even a quick email to the City’s Planning staff. They are very helpful and knowledgeable about these projects. Perhaps you should spend a little more time researching your “stories” and a little less time casting aspersions on residents who have and continue to work hard to fight for the things that make this city great – our neighborhoods and our schools. Thanks, Susan. I’ll doublecheck the facts, but the KSI project was originally filed for approval in 2003 (before the APFO was adopted) and refiled in 2006 (after the APFO was adopted; see USE2006-00697). Their Use Permit expired in 2008, but they received a couple extensions, which according to my records ultimately expired in 2010. Nevertheless, the results are still the same–a 325-unit residential project will be added within the overcrowded Beall Elementary School boundaries and the Mayor and Council had an opportunity to rethink a decision made years ago using the historic designation process on October 14. That’s not how I like to use historic preservation (I was advocating for the preservation of the existing bank building, not opposing the KSI project), but that’s the tactic they used to control the expansion of a church at 628 Great Falls Road at the same October 14 Mayor and Council meeting. As for “accusing a resident,” please remember that my complaint was filed against anonymous persons (plural), not a specific individual. A couple King Farm residents told us that a couple people were distributing anonymous campaign literature–that’s not allowed under our Election Code and as the manager of Team Rockville, I need to be sure our opponents and their supporters are playing by the rules, just as I would if I were coaching a sports team. I expect our opponents are watching us as carefully as well and would complain if we did something inappropriate (and indeed Drew Powell and Joe Jordan have filed complaints with the Board of Supervisors of Elections these past few months, both of which have been resolved with no rancor). At a meeting tonight of the Board of Supervisors of Elections (BOSE), they found that Echo Lin prepared and distributed the flyers in King Farm on her own, based on the testimony she provided during Citizens’ Forum at the Mayor and Council meeting on Monday, October 28, and as a result determined that the issue had been resolved. Had she worked on this with others to support or oppose a candidate, they could have violated the Election Code–I think. The City Attorney suggested that the Election Code may need to be revised to allow anonymous campaigning for candidates as well as “principles and propositions,” a major change from our practices of nearly 20 years (see Ordinance 7-95). This was mentioned quickly so I may not be describing it accurately, but I sense a significant change to the Election Code may occur as a result of this complaint. BOSE is collecting suggestions for revisions to the Election Code, so if you have any, please send them to clerk@rockvillemd.gov. This would be an extremely bad change. The law needs to be tightened, not loosened. Wouldn’t the mayor and council have to approve such a change, with the attendant public hearings? FYI–You were cited as making an error on BGII but I believe both you and Susan actually both said the same thing–2008. The revised design actually called for 74 units and would have resulted in an estimated five or fewer children, a number easily surpassed by one or two single-family homes (which are exempt from the APFO). The defeat was a great loss for the city; at least Victory Court, although for seniors, did not meet the same sad fate. Seems to me the BOSE had a duty and responsibility to ascertain the veracity of the claim of working alone. Given the wording of the flyer and photos like this, it strains all credulity.